Though he is young, Optimus Prime is one of the mightiest warriors ever to come from Cybertron. Sworn to defend life and freedom no matter what its form, he has taken the AllSpark, Earth, and its people under his personal protection. Megatron and his group of evil Decepticons will stop at nothing to capture the AllSpark and conquer the universe, but Optimus Prime and the Autobots that follow him will never surrender. They will never stop fighting until Earth and Cybertron are safe. Robot Mode: Roll Out Command Optimus Prime suffers from the fact the is basically built around a gimmick. His legs are fully articulated and quite nice, but his entire upper body is beholden to an auto-transformation gimmick that makes it transform on its own by rolling the figure in truck mode across the floor. Also it contains a lights and sound gimmick and a mechanism for Prime to perform some axe-swinging. As a result the upper body is basically restricted to the movements required for the transformation and the axe-swinging, little else. The right arm doesn’t stay extended due to the gimmick and there is almost no articulation wotrth mentioning. One thing Roll Out Command Optimus does have is the most cartoon-accurate version of Optimus’ battle axe. He can hold it in either hand, but by putting it into his right one and pressing the button on the hand causes the blue energy blades to pop out, as well as the rocket flames. Nicely done and the best thing about this figure. Apart from that, though, not really worth your time unless you’re a little kid having fun with the axe swinging and the built-in sound effects, which cause his mouth plate to move. Alternate Mode: Once again Optimus transforms into a red and blue fire truck, much like all the other incarnations of Animated Prime. Apart from being pretty big there is little to differentiate this truck mode from the others. Built-in sound effects work here, too, of course and the little blue lever on the front bumper turns his auto-transformation gimmick on and off. The big axe can be stored on the rear, but not really in any sort of meaningful way. So bottom line: a fully average truck mode. 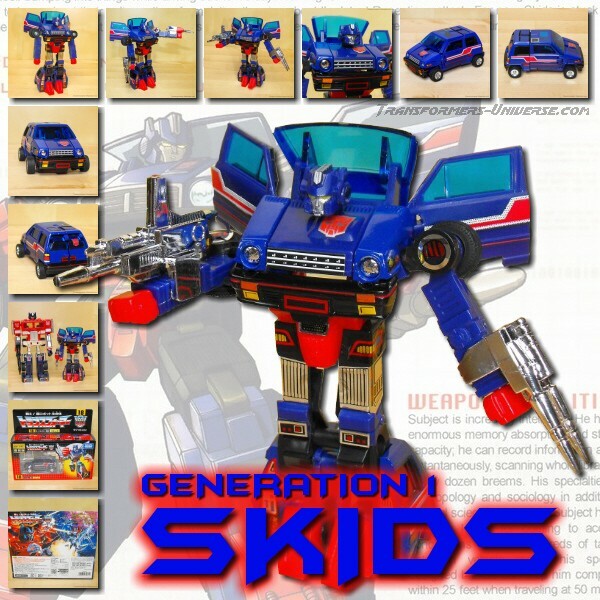 Remarks: The Animated toy line gave as an Optimus Prime figure in just about every size class and gimmick line, including the Supreme size class. Well, kind off. Roll Out Command Prime isn’t really comparable to other Supreme class figures as he is basically an oversized Activator toy. This toy was a shelf warmer during the time of Animated and can usually be found for pennies on ebay. He’s fun, yeah, but he doesn’t really fit with the other toys scale-wise and takes up shelf-space like crazy. I bought him because I’m an Animated fanatic and in order to support a local small toy store, that’s pretty much it. Overall, though, I can’t really recommend him to anyone unless you’re as crazy about Animated as I am and even then I’d advise you to think twice about it.